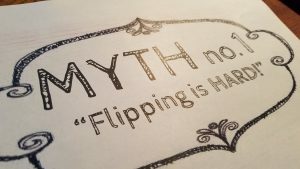 I hope to cover just a couple myths about flipping in the next few blogs. The first two have to be grouped together because they are opposite sides of the same coin and both address the real and perceived effort required to flip a class. Myth number one: “It it’s really hard to flip a classroom”. Myth number two “It’s really easy to flip a classroom”. I did warn you it’s a paradox. The first myth is that it’s hard to flip a classroom, it’s not. In fact, the very first step to flipping the classroom is taking what you already do really really well and determining needs to be done all in the classroom, some done the classroom, or none done in the classroom. While that may sound a little strange, what you do in the classroom really really well may be preparing students with the basic foundation knowledge. If that is the case, most basic foundation knowledge doesn’t need to be acquired in the classroom, or at least in the group space, it can be acquired by the student in their own personal space. That personal space may be analog or that personal space may be digital. If your best thing is group activity and interactive collaboration, then that almost certainly must be done in the classroom. That means that some of the other classroom stuff needs to be moved out of that classroom space so you have more time for awesomeness. In most cases, we fall somewhere between and some of the things we do in the classroom don’t need to be done there with all eyes on the teacher, or all eyes on something else. If we can find ways to move certain components to an individual space where students come prepared and are comfortable when they come to the group space, then we can make what we do in that group space all the more productive for them. This allows what happens in the classroom to become our best things. This evaluation and realignment of location is the basis of flipped learning. Flipped learning is not “video at home, homework at school”. While that model could be a component for some types of classrooms in some situations, that overly simplistic definition is just as boring as it is simple. Okay fine, so if all I’m to do is take the best stuff that I already do and do something to move it, how hard is it to get started? The answer is “it isn’t hard”. You likely already have the worksheets, lab reports, guided notes, or graphic organizers you already use, and those are easy enough to put in some sort of digital format where students can access them 24/7. The instructions that may go with some of those worksheets, lab reports, or activities are easy enough to record with your cell phone. It is as easy as recording a greeting selfie from the gates of Walt Disney World for your family, or everything you post to Facebook, so that’s not hard either. If you’re thinking about moving some direct instruction out of the classroom space and into the personal space, that’s not overly challenging either as it is the same process as the Facebook post mentioned previously, an the content for a lesson you’ve likely taught a dozen times. Be forewarned, 45-minute in class lessons will boil down to only about eight minutes of information when you take out the pauses, waiting on students to answer, or addressing the day-to-day organizational tasks. That awesome lecture may only have a good ten minutes in it, and that’s the whole point.